The aim of this study is to propose an empirical spatial model to estimate the spatial variability of grapevine phenology at the within-field scale. This spatial model allows the characterization of the spatial variability of a given variable of the fields through a single measurement performed in the field (reference site) and a combination of site-specific coefficients calculated through historical information. This approach was compared to classical approaches requiring extensive sampling and phenology models based on climatic data, which do not consider the spatial variability of the field. The study was conducted on two fields of Vitis vinifera, one of cv Cabernet Sauvignon (CS, 1.56 ha) and the other one of cv Chardonnay (CH, 1.66 ha) located in Maule Valley, Chile. Date of occurrence of grapevine phenology (budburst, flowering and veraison) were observed at the within field level following a regular sampling grid during 4 seasons for cv CS and 2 seasons for cv CH. The best results were obtained with the devised spatial model in almost all cases, with a Root Mean Square Errors (RMSE) lower than 3 days. However, if the variability of phenology is low, the traditional method of sampling could lead to better results. This study is the first step towards a modeling of the spatial variability of grapevine phenology at the within-field scale. To be fully operational in commercial vineyards, the calibration process needs simplification, for example, using low cost, inexpensive ancillary information to zone vineyards according to grapevine phenology. The authors of this paper wish to thank National CONICYT Doctoral Fellowship 2013 N°21130504 and PIEI Program of Agricultural Adaptation to Climate Change funded by the University of Talca. Parker, A., García de Cortázar-Atauri, I., Chuine, I., Barbeau, G., Bois, B., Boursiquot, J.-M., … van Leeuwen, C. (2013). Classification of varieties for their timing of flowering and veraison using a modelling approach: A case study for the grapevine species Vitis vinifera L. Agricultural and Forest Meteorology, 180, 249–264. http://doi.org/10.1016/j.agrformet.2013.06.005. Valdés-Gómez, H., Araya-Alman, M., Pañitrur-De la Fuente, C., Verdugo-Vásquez, N., Lolas, M., Acevedo-Opazo, C., … Calonnec, A. (2017). 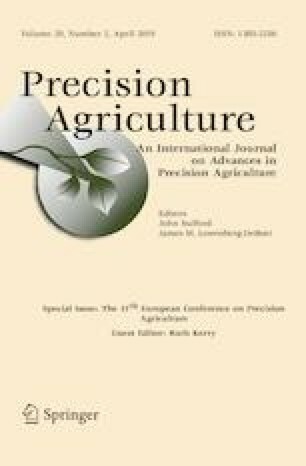 Evaluation of a decision support strategy for the control of powdery mildew, Erysiphe necator (Schw.) Burr., in grapevine in the central region of Chile. Pest Management Science. http://doi.org/10.1002/ps.4541.